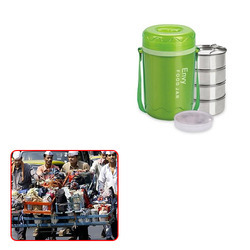 Offering you a complete choice of products which include insulated tiffin for tiffin service. To stand tall on the expectations of our patrons, we are engaged in manufacturing, supplying and exporting Insulated Tiffin for Tiffin Service. Compact in design, these tiffin boxes are manufactured under the supervision of experienced professionals who are well-versed in this domain. To leave no scope for defects, we check these products on various stages.